London Fashion Week is a huge business. 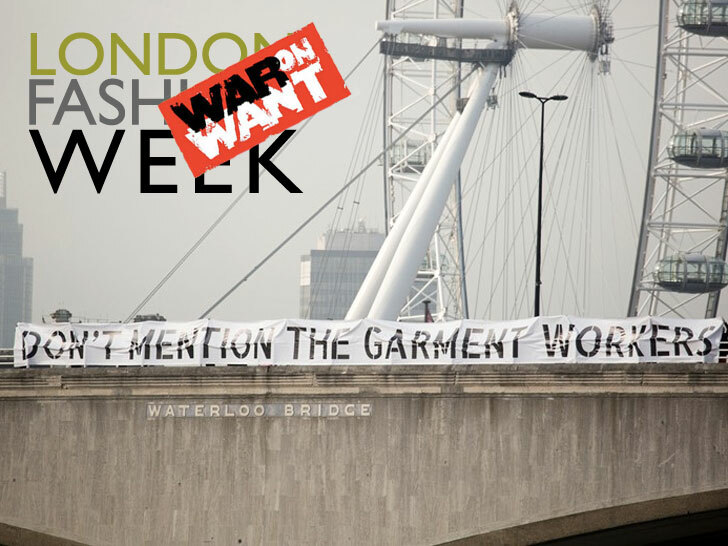 War on Want estimates that orders of roughly £100 million ($162 million) will be placed during the event—that’s enough to pay a month’s wages for 2.4 million Bangladeshi garment workers who earn a minimum wage of £42 ($68) per month. But the time to pretend that 1,138 Bangladeshi workers who died at Rana Plaza, the six Cambodians shot dead for asking for a pay raise, or the Pakistani workers who were burned alive behind locked factory doors don’t exist is over, Hoskins said. As London kicked off its biannual Fashion Week at Somerset House Friday morning, an entirely different scene unfolded on nearby Waterloo Bridge. Campaigners from anti-poverty group War on Want and other labor-rights organizations unfurled a 98-foot banner emblazoned with the words "Don't Mention the Garment Workers," a reminder of the millions who toil under grueling conditions for the fashion industry. �London Fashion Week is a glittering showcase for the fashion industry. But fashion�s dark side is kept in the shadows," said War on Want senior campaigner Owen Espley. �The British Fashion Council would rather we all forget about those who often work long hours, on poverty pay, in unsafe conditions to produce the clothes we love."